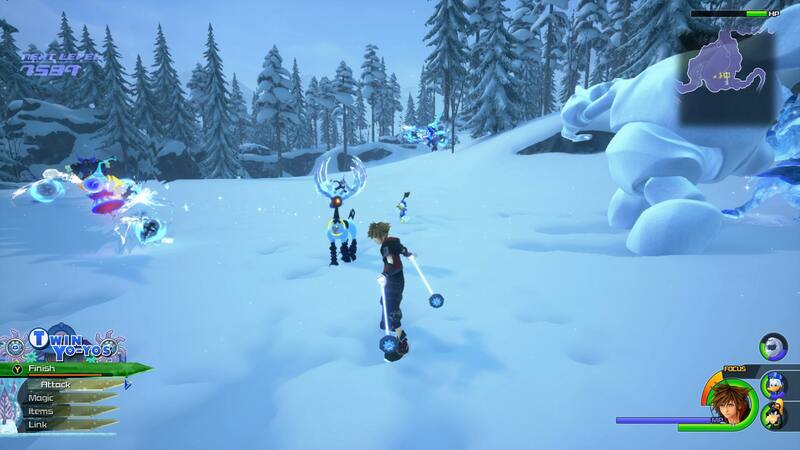 One of the later worlds of Kingdom Hearts 3 takes players to the world of Frozen. 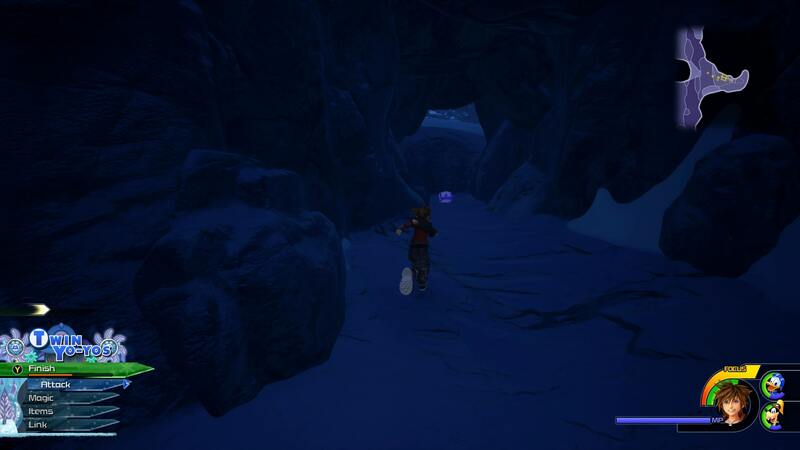 It’s a tricky level to navigate, given that it’s mostly comprised of narrow mountain paths and labyrinthian ice caves. 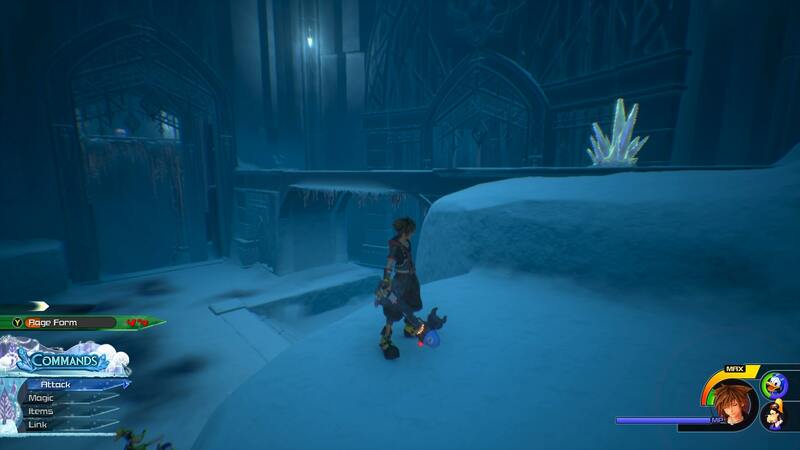 To help you make it through Arendelle, we’ve put together this Kingdom Hearts 3 Arendelle Walkthrough. 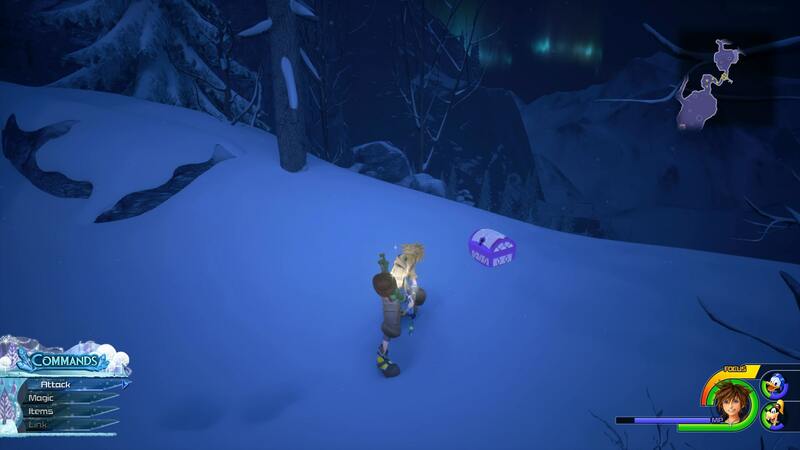 It will show you where all of the Arendelle Treasure Chests are, how to get the map, and also where to find Olaf's pieces. 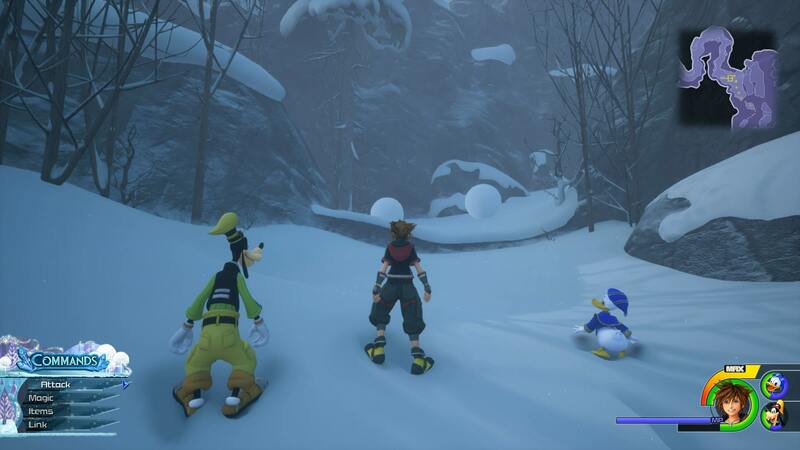 If you’re looking for anything else Kingdom Hearts 3 related, be sure to head over to our Kingdom Hearts 3 Guides Hub. 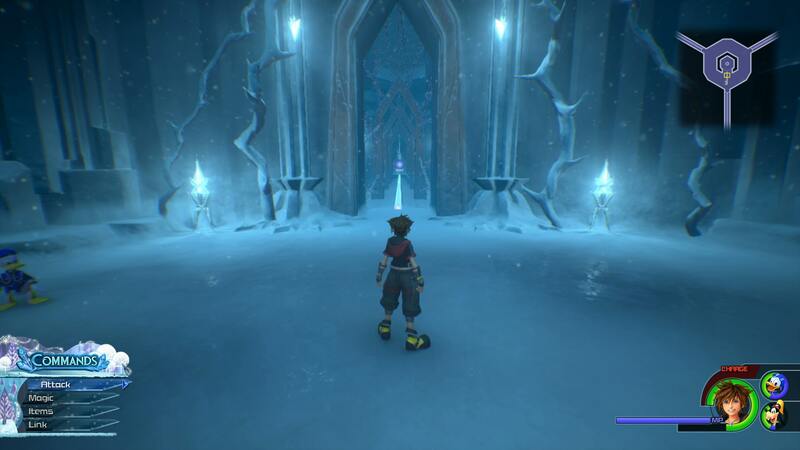 It’s where you’ll find all of our Kingdom Hearts 3 Guides Content, from detailed walkthroughs, to a breakdown of each Keyblade. 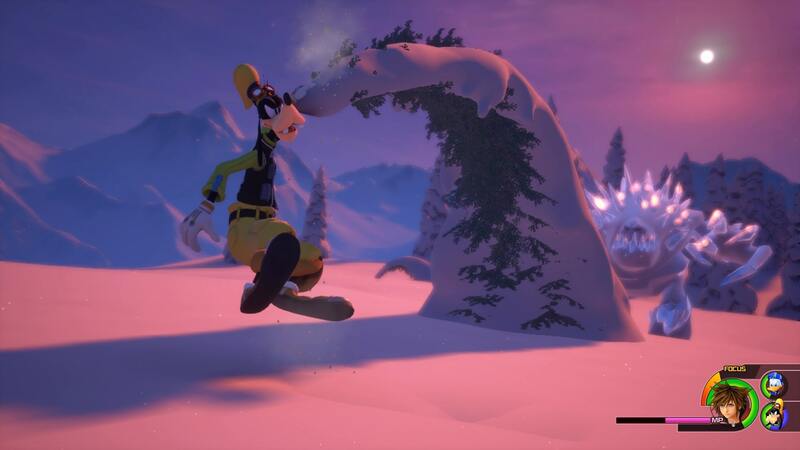 Upon Arriving in Arendelle, you’ll see a mysterious figure skating across the icy lake. There’s a nearby Shop and Save Point, and a Chest containing the Map. Head up the path and defeat the enemies that await. There is a Chest behind them. Continue onwards, defeating the enemies that block your way. 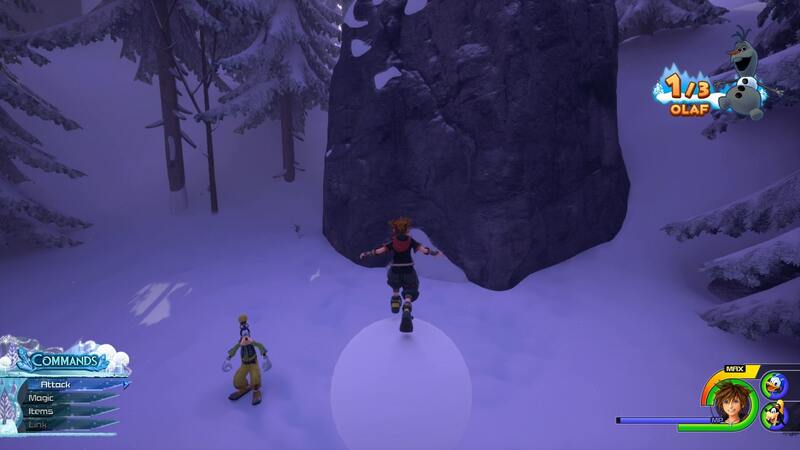 You’ll come across a large snowball which you can jump on top of and break. Up ahead is a cliff you can scale. Follow the path and then jump off of the edge. 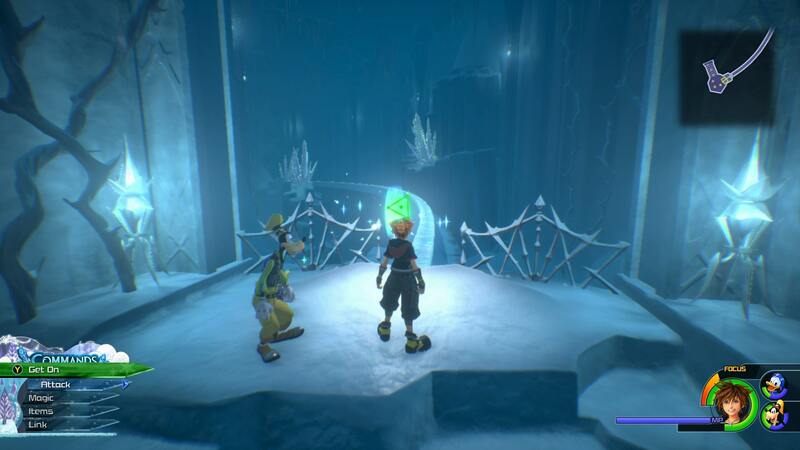 Use a dive attack to break the ice block below to reveal a Chest containing The Klondike Kid. Into the Ice Labyrinth now, so start by following the path ahead. 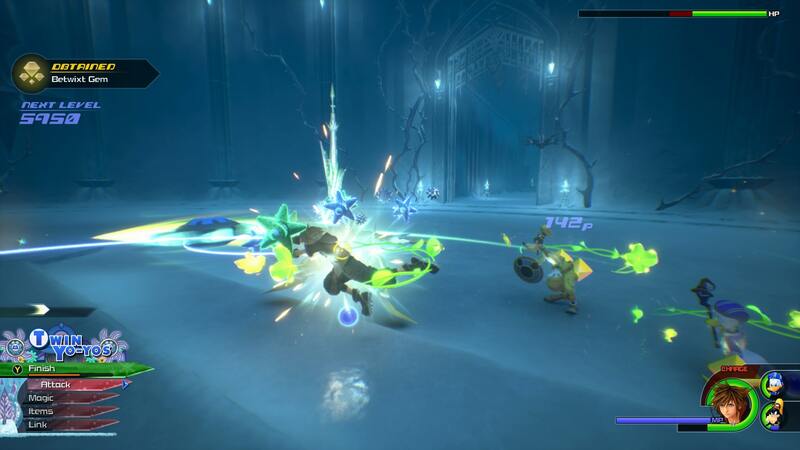 Defeat enemies, and look for an ice wall that you can break. 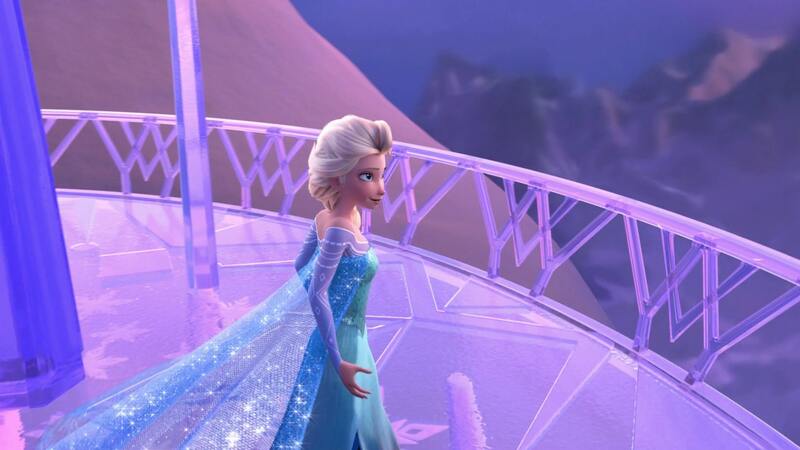 Continue onwards until you reach another ice wall. Break it and head inside. 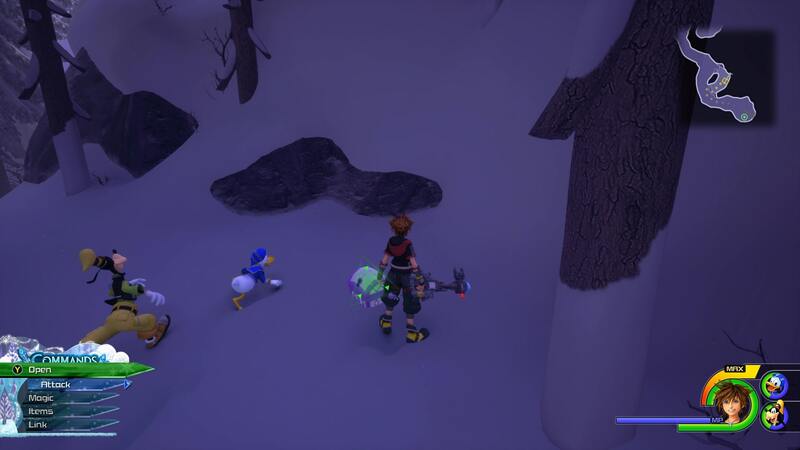 Defeat the Heartless inside, there is a Mickey Emblem in here. Exit and head up the stairs to the left, there’s a room to the right with stairs leading up. Take the stairs and you’ll be able to drop down to a Chest you’ll have seen earlier. Grab the Chest and then head back around. Go upstairs to the large arena area. Defeat the enemies. You’ll notice an icy spire in the room. Keystep to it and spin. This will move the room. Follow the path that is revealed and drop down the slopes. Defeat the enemies ahead and then save. Spin the next icicle. Grind the rail ahead, while shooting enemies. Follow the corridor and defeat the enemies ahead. You’ll enter a large room, filled with enemies. Spin the icicle. 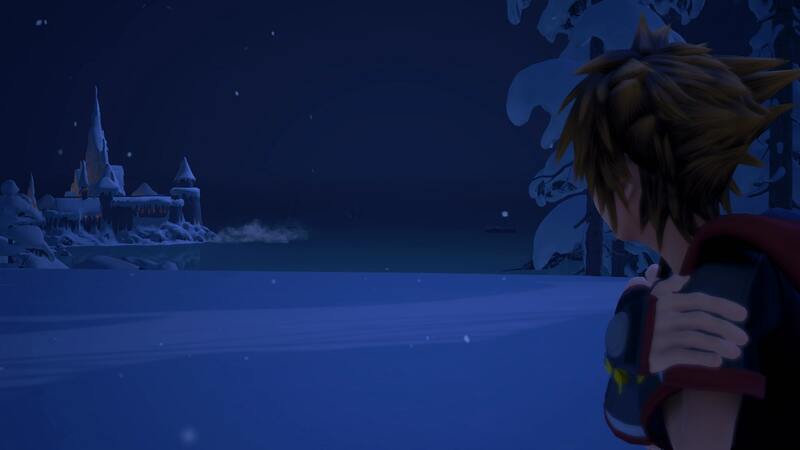 After the cutscene, turn around and head right. Follow the path around and grind the nearby grindrail. This will take you to a room filled with difficult enemies. You can get great resources here, or you can skip it. Head back outside and follow the room around to another grindrail. This leads to a room with a Mickey Emblem inside. Exit and go back to where you started, grind the final rail. You’ll reach an area with two Chests. Get the Chests and then interact with the portal. Once you’ve exited the portal, there’s a Save Point to your left. Continue forwards and defeat enemies. Now go to the other one, and follow the path around. Continue and climb the cliff. 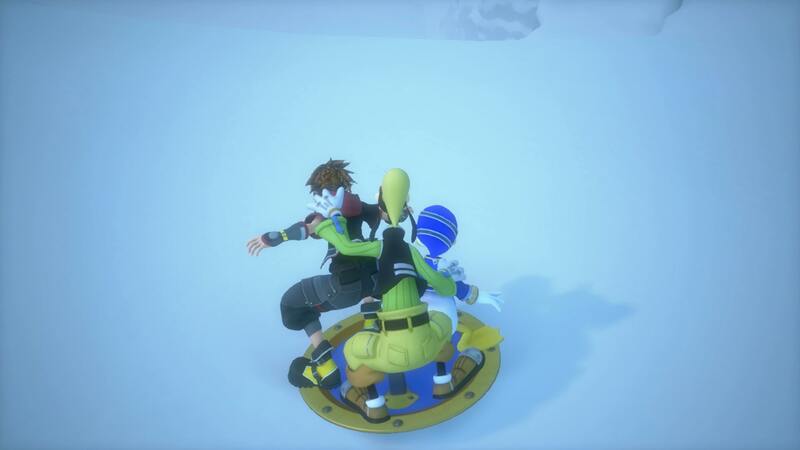 Head onwards to trigger a very musical cutscene. Next up is a downhill sledge run. Avoid the lazers.The next phase is a leisurely glide down the mountain, collect as many orbs as you can. 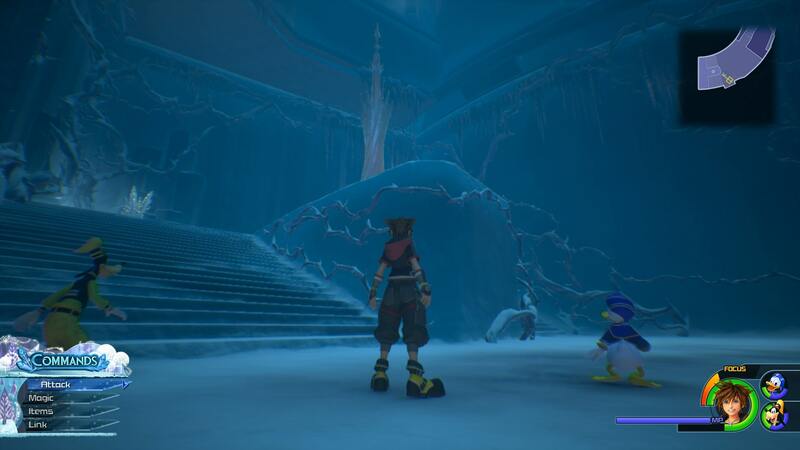 Boss fight with three ice dragons. Use Agile Claws or Favorite Deputy to close the gap. Use Keystepping and projectiles. 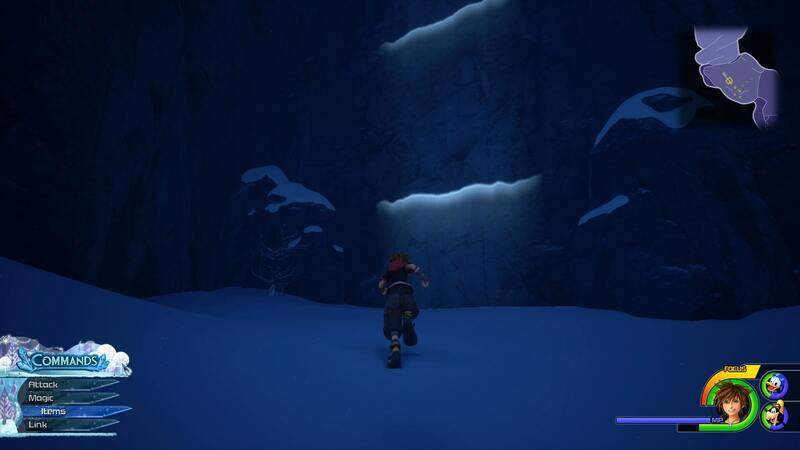 Continue forward, there is a Chest to collect up on a ledge to the right. 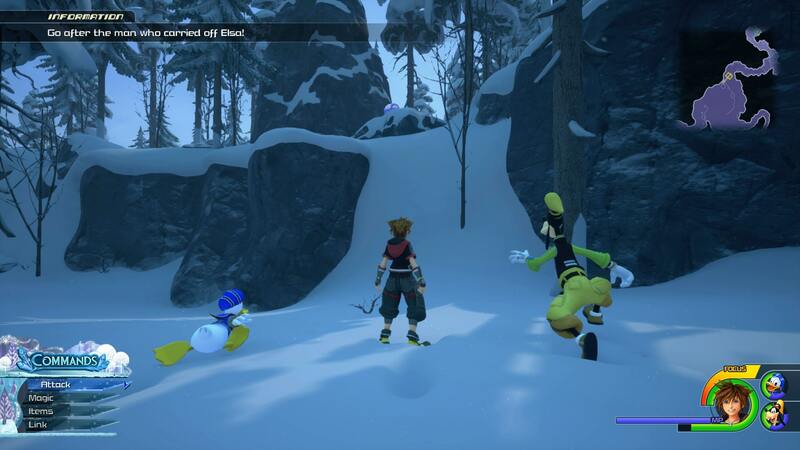 After another cutscene, you’ll be tasked with finding 3 Olaf bodyparts. 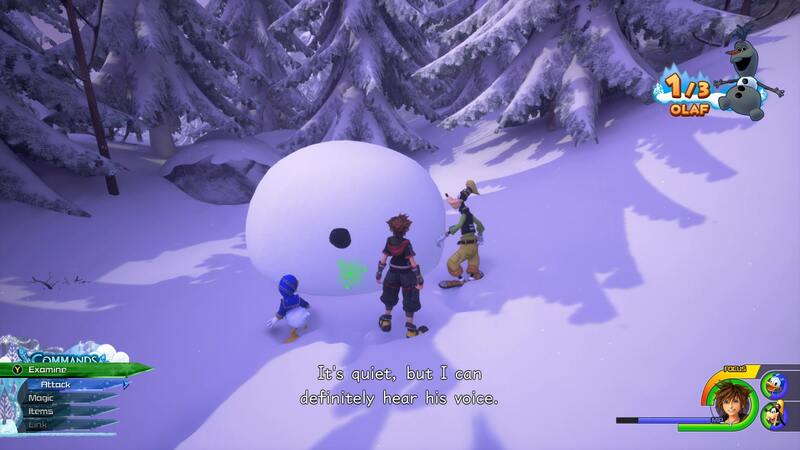 The next challenge is to find Olaf. Seems simple enough, only he’s managed to go and get himself dismembered, so you’ll need to find all of his parts. There are three to find, the first being in the image below. 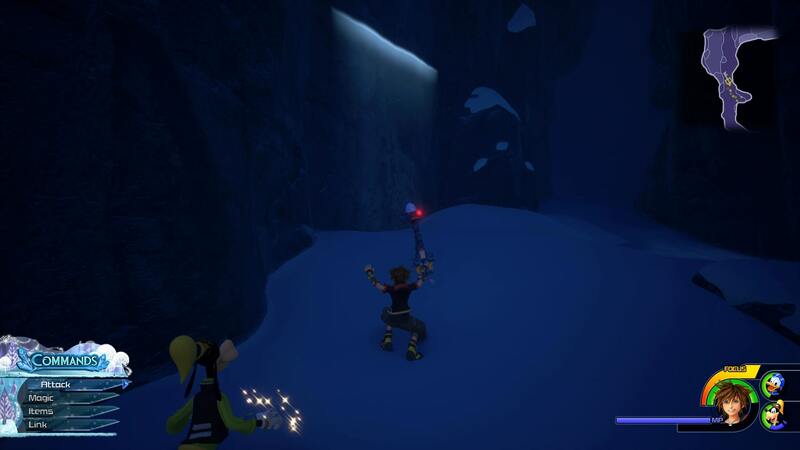 To get there, scale the ice cliffs ahead and go around to the right. Slide down the slope and jump to the right. 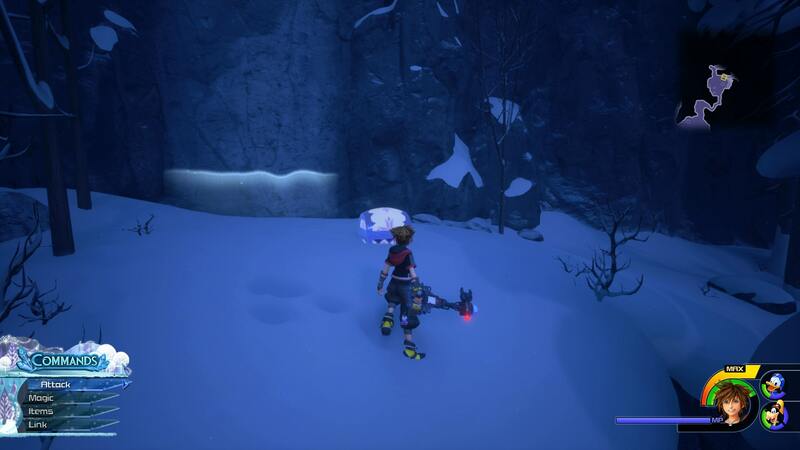 Olaf’s head is hidden in this snowball, so jump on it and run it into a wall to free him. Finally, you need to catch his legs, which is easy enough. 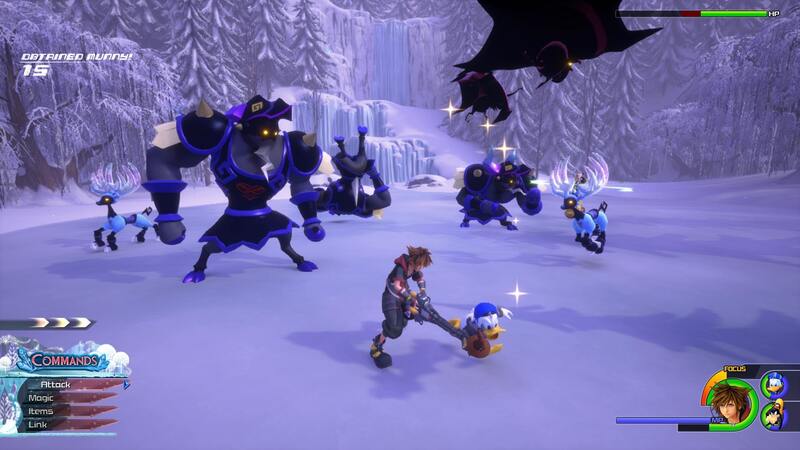 After a cutscene you’ll need to defeat a large group of Heartless. 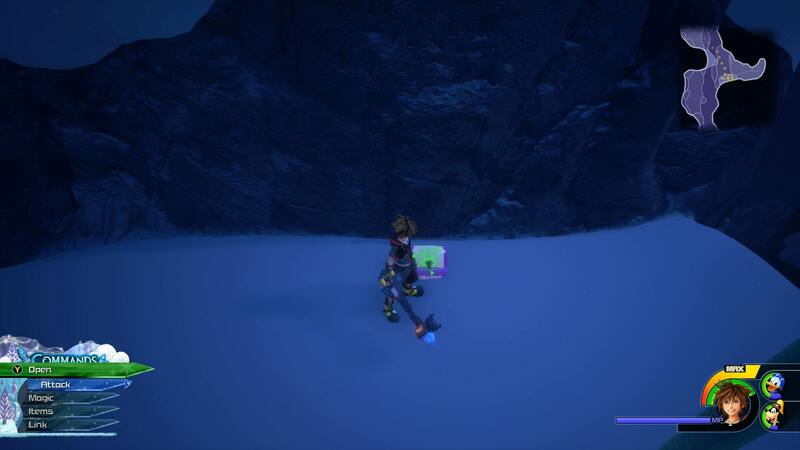 There’s a Chest by heading left after scaling the ice cliffs as before. 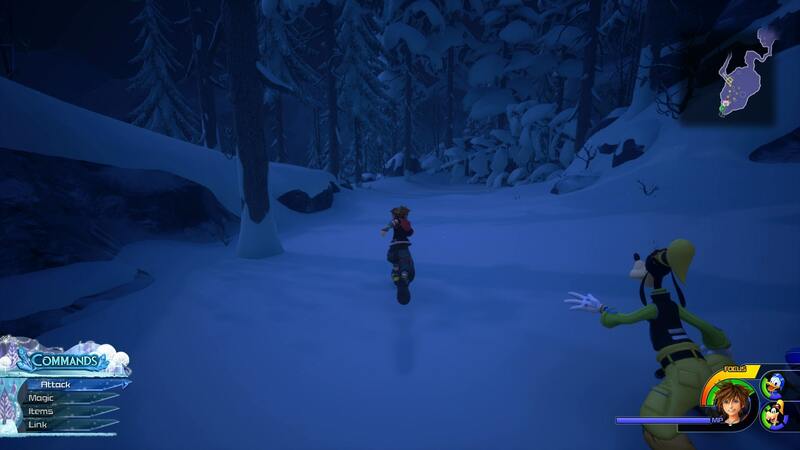 Head back in the direction you came from, there’s a Snowball to break, and a Chest to the left of it. Proceed forwards and defeat the enemies ahead. 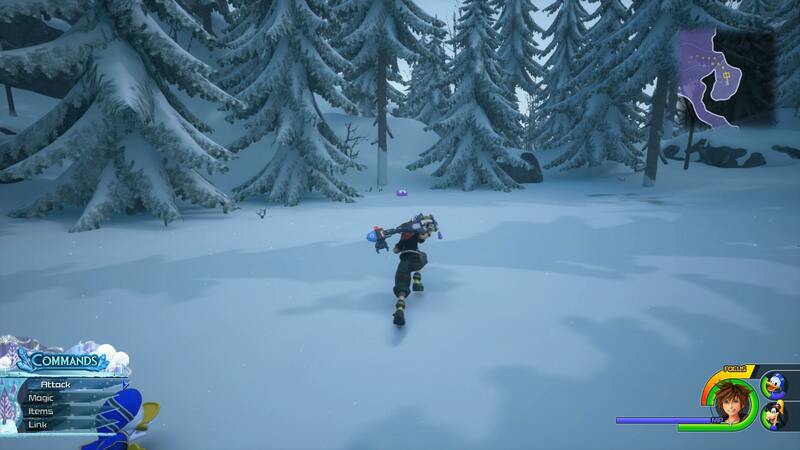 You can use the snowballs to kill them quickly. If you head up around the path to the side, you can jump across the gap to get another Chest. Continue forwards. Run up the cliff and then make your way up and round, defeating enemies as you go. Take cover when prompted and perform a Cover Shot. Move up the hill, and take out enemies using Cover Shot. 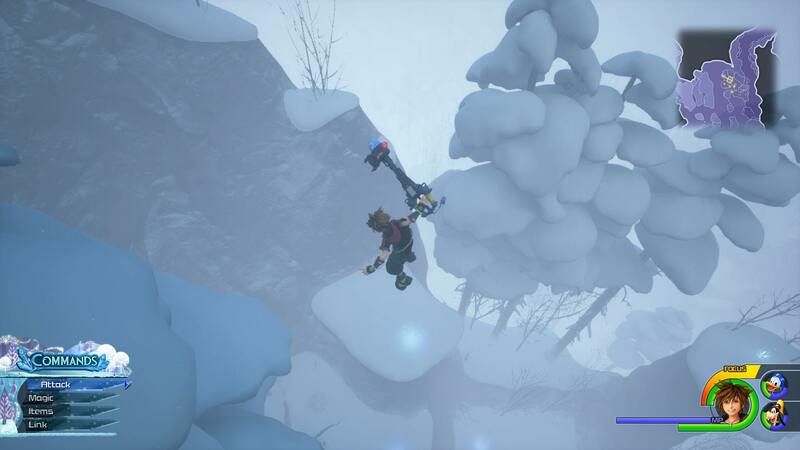 You’ll see air gusts that you can use to jump up the mountain. 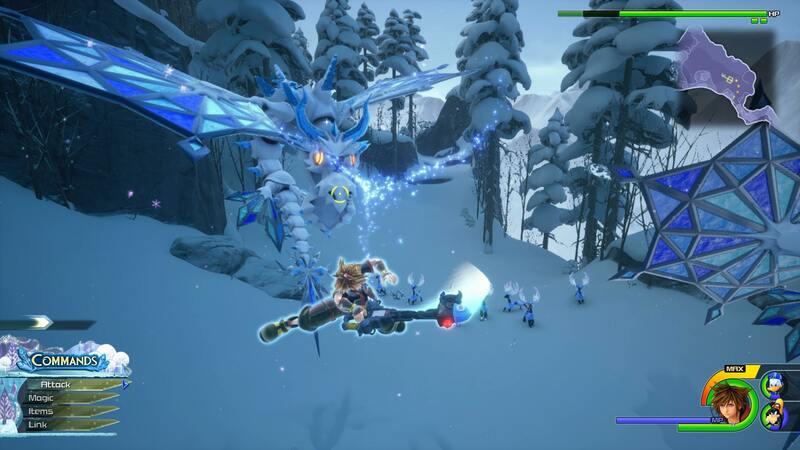 You’ll come across another Ice Dragon, which you will need to defeat. Run up the cliff and then use the stepping stones to reach higher. Keep moving up the hill, there are Raspberries on the way up. 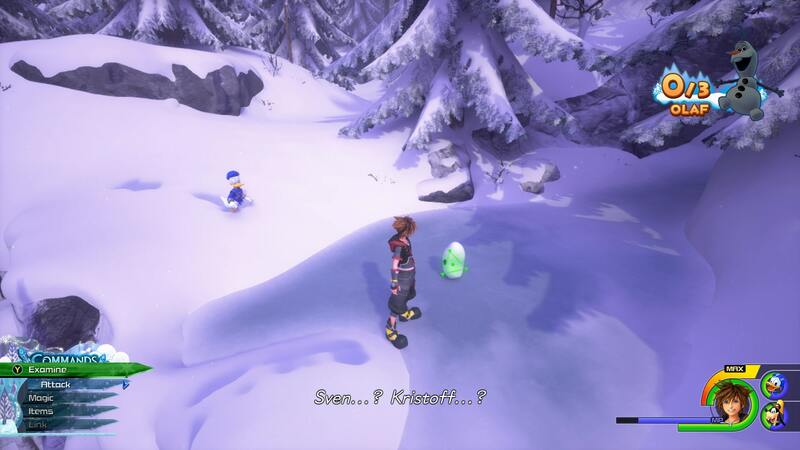 You’ll come across two snowballs, and then a group of enemies. Defeat them and continue. Up ahead are more Ice Dragons, jump down and pummel them. Head up the cliff and follow the path around, you’ll find a Chest. Continue onwards and fight 3 heavy enemies. There’s a Lucky Emblem up ahead. 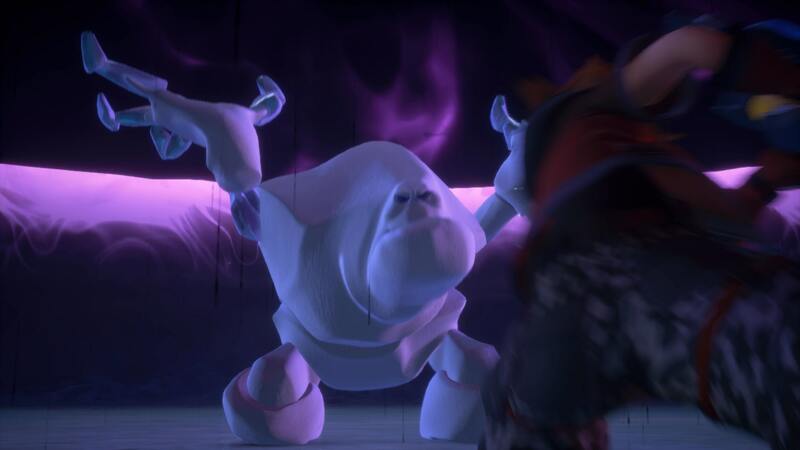 Next you need to fight the Snow Monster. Use the Tree Whip attack when prompted. 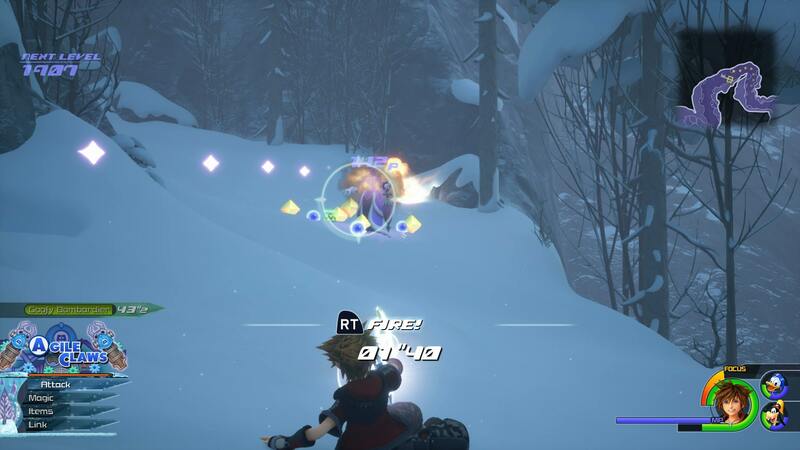 Fire attacks will stagger it, and make sure to dodge when the enemy is armored and charging. 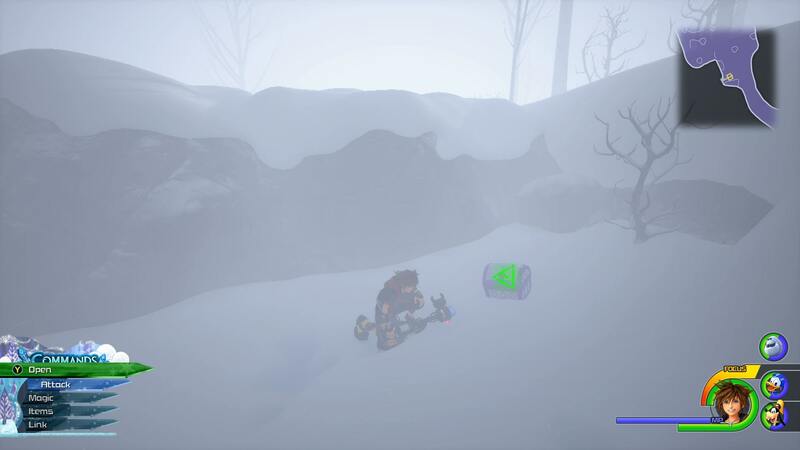 Enemies on this hill, use snowballs to take them out. Head forwards, there is a Chest up on your right. 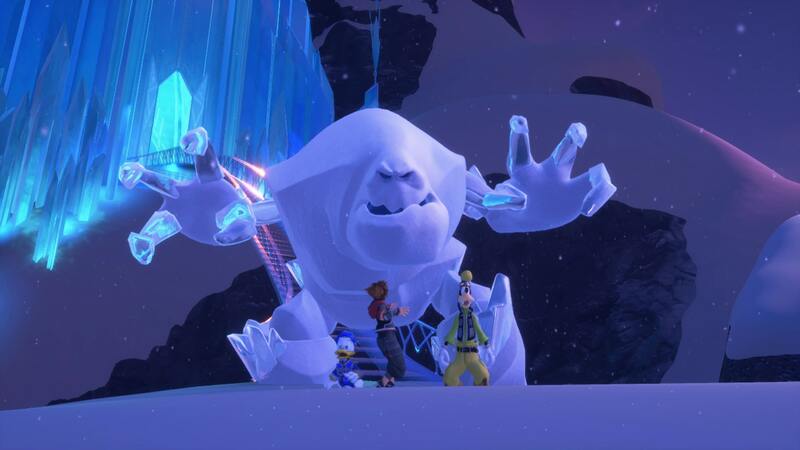 Befriend the snow monster and defeat the enemies ahead. Run around to the Shop and Save Point on your Map. There are strong winds ahead, so you’ll need to take cover and slowly move your way up. 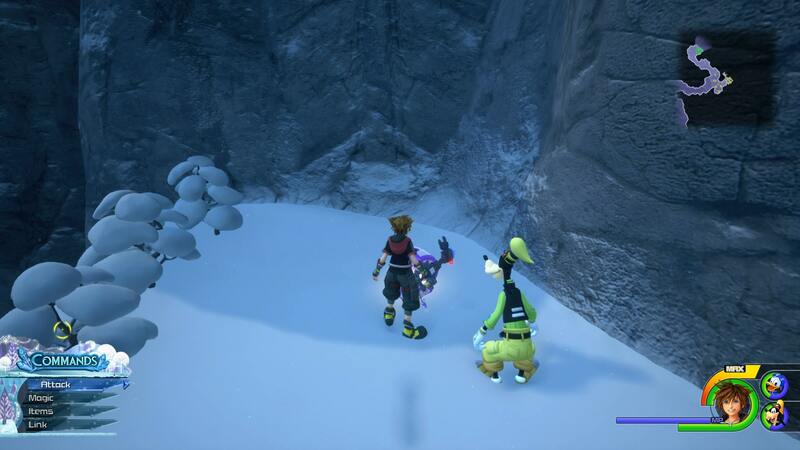 There is a Chest at the end to the right of the Snow Monster. Finally, we have the Ice Wolf fight. It is pretty tricky, but as long as you make sure to defeat his minions before the time limit, you can trigger Subzero Impact. Do this twice and you’ll defeat it. 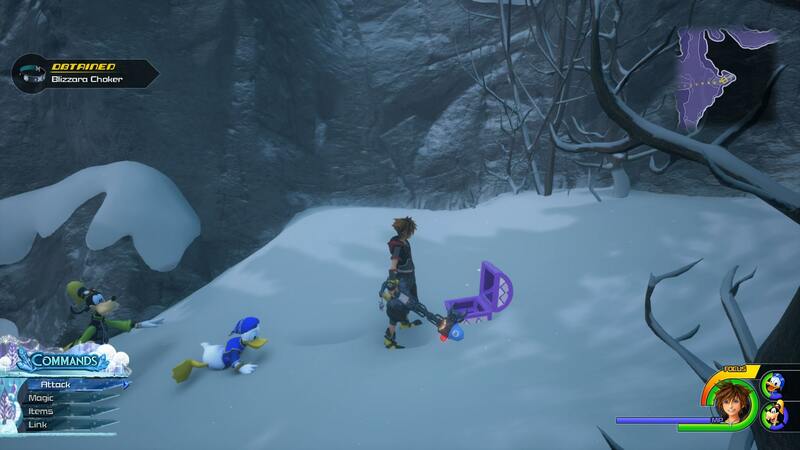 With the main baddie dead, all that’s left is to collect your new Keyblade. 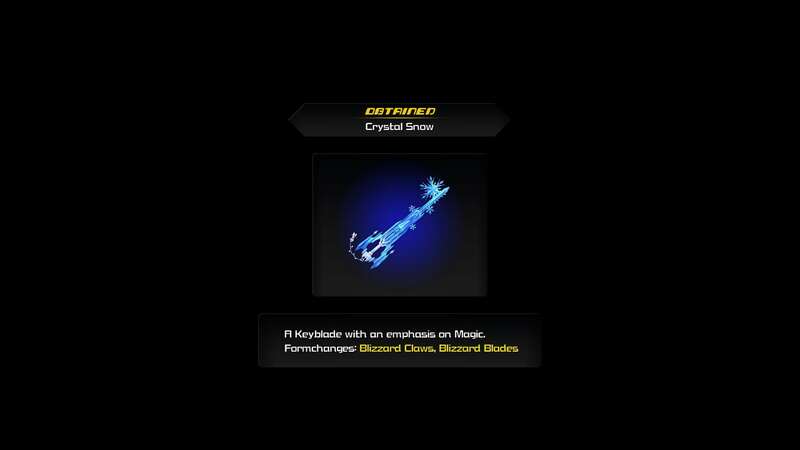 It’s called Crystal Snow, and for more details about it, visit our Kingdom Hearts 3 Keyblade Guide. 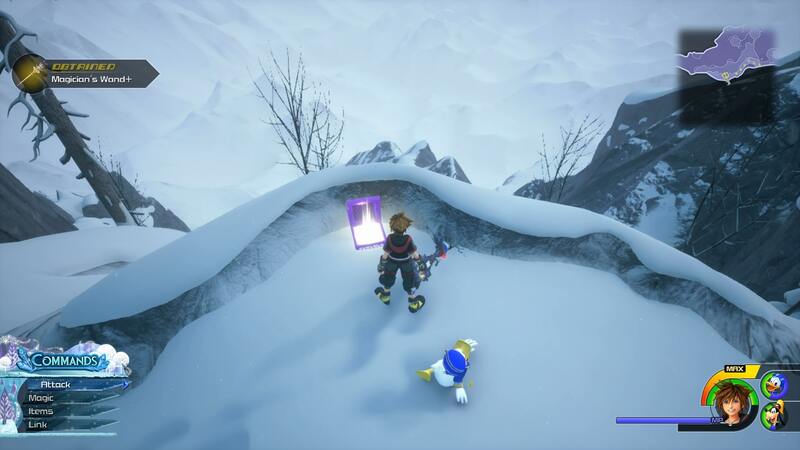 There are a bunch of Treasure Chests to get in the Arendelle level of Kingdom Hearts 3. We’ve included what we’ve found so far in the walkthrough above. Once we’ve doubled back, we’ll be sure to add more if we find them. 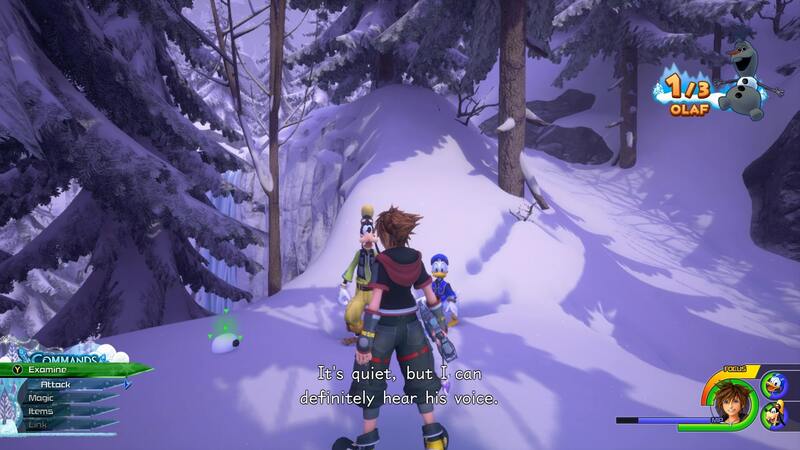 That’s everything you need to know about Arendelle in Kingdom Hearts 3. 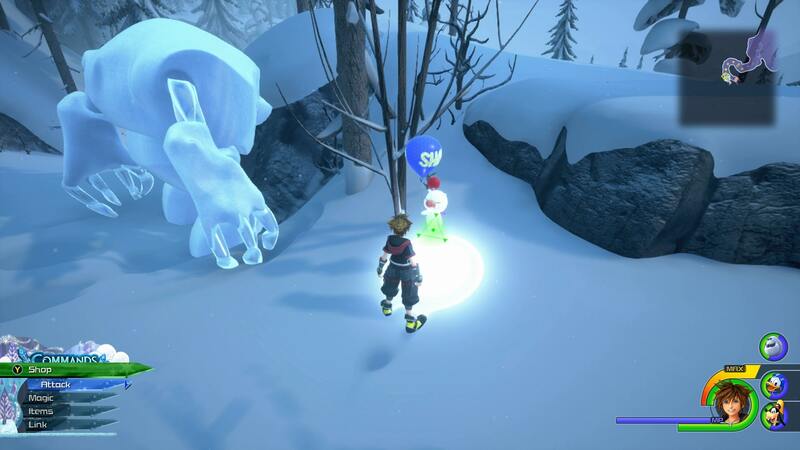 For a breakdown of all of the Lucky Emblems we’ve found so far, visit our Kingdom Hearts 3 Lucky Emblems Guide. 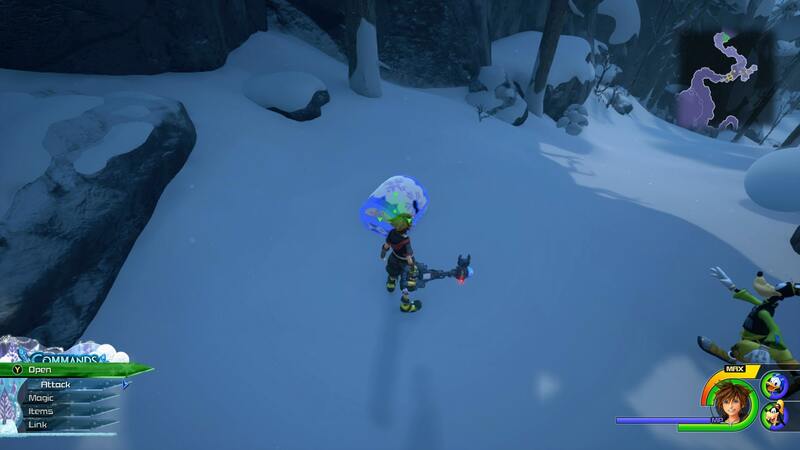 For a look at where to find each Ingredient, there’s our Kingdom Hearts 3 Ingredients Guide.